Ouija boards—also called spirit boards or talking boards—have been part of various cultures long before the introduction of the "game" in the 19 th century. "Ouija", in fact, is the name of the game invented by Elijah Bond. 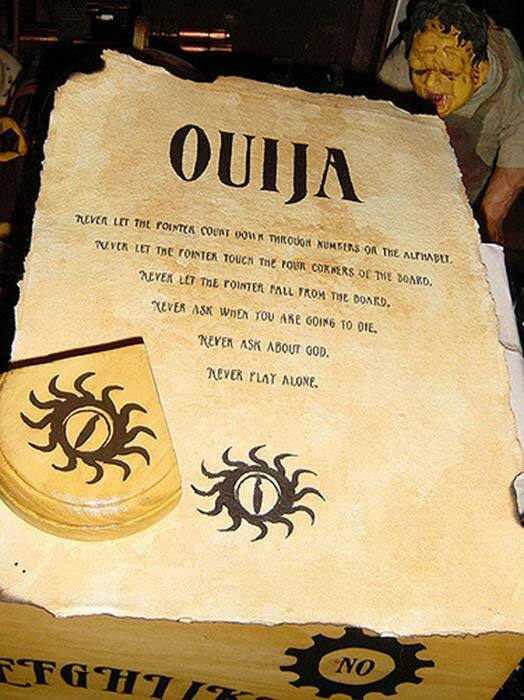 Authentic Ouija boards are known to practitioners as the aforementioned spirit or talking boards. Regardless, these panels all share characteristics: the board itself has each letter of the alphabet dictated, as well as the numbers 0-9, and then whether or not it is inscribed with "hello", "goodbye", or other full words depends on the creator of the board. Each board has a planchette, an essential piece in the ritual. It is the planchette which the people choosing to communicate place their hands upon in the hope that the spirits will move it to create a message. An Earthly Explanation of How Ouija Works? Despite the lengthy history of talking boards, modern scientists are highly invested in disproving their use. One of the prominent theories is called "the ideomotor effect". This effect can occur in two different ways: either someone intentionally moves his/herself to jostle the table, or the audience accidentally moves the table through subconscious muscular twitches. When paired with a strong desire for a supernatural effect, it is easy for spirit board users to believe the spirits are behind the movements. In essence, the ideomotor effect is most effective when the participants have a strong source of faith in the board. The ideomotor effect is best exemplified in a parlor trick called table tilting. This practice is precisely what it sounds like—the table shifted and moved, thereby allowing the pointer to as well. This could be a simple actual tilting by a certain person or party, or a more athletic affair. Popular in the Victorian era, when the supernatural and occult were of intrigue to the rich and poor alike, table tilting consisted of the table jerking violently in which "the sitters would find themselves chasing around the room trying to keep up with the table". Interestingly, though this practice did prove the falseness of the spiritual claims, experiments revealed it was caused by the aforementioned accidental movements or muscular twitches by the participants. Historically, talking boards find their beginnings in the Chinese Liu Song Dynasty (5 th century AD) and was popularized later in a subsequent Song Dynasty (10-13 th centuries AD). Called planchette writing or fuji (fu chi ), these boards were similarly used to communicate with the deceased, however it was believed to be a form of necromancy rather than a mere instrument akin to a telephone. In fuji, however, the writing was created through a "sieve to which was attached a short stick. It was held generally by two persons at either side to trace characters on sand or ashes…The characters were supposed to have been produced by the gods". These historical facts are pertinent to the study of talking boards as it reveals the extensive culture surrounding the practice. In the present day, spirit boards continue to be known as a form of telephoning between the worlds of the living and the dead. The board itself has retained the general template of the earlier nineteenth century patented models (i.e. Bond's "game"). The modern-day ouija is not all fun and games, and in one particular case, its use had a very serious outcome. A convicted double murderer won the right to a retrial on the basis that four of the jury had used a ouija board the night before finding him guilty. Stephen Young of Pembury, England, a 35-year-old an insurance broker, was given a life sentence in March, 2017, for murdering the newly-wed couple Harry and Nicola Fuller at their cottage in Wadhurst, East Sussex. However, he was given a retrial after four jury members disclosed that the night before returning their verdicts they had used a ouija board to contact the spirit of murder vicitm Harry Fuller, who they believe told them to ‘vote guilty’. While talking boards have become less seriously valued among participants today, it does remain an occasional "game" or, more regularly, a daring challenge. For all the experiments science has performed, few things are more powerful than the beliefs of the mind. Faraday, Michael. 1853. "Experimental Investigation of Table-Moving", Athenaeum, No.1340. pp. 801–803. Faraday, Michael. 1853. "Table-Turning." The Times , No.21468. pp. 8. French, Chris. 2013. "The unseen force that drives Ouija boards and fake bomb detectors." The Guardian . Accessed May 28, 2017. Murch, Robert. 2007. "Elijah J. Bond." e lijahbond.com. Accessed May 27, 2017. Reed, H.B. 1995. "Ideometer effect." An Encyclopedia of Claims, Frauds, and Hoaxes of the Occult and Supernatural. Spitz, Herman H.; Marcuard, Yves. 2001. "Chevreul's Report on the Mysterious Oscillations of the Hand-Held Pendulum". Skeptical Inquirer . Center for Inquiry. 25.4. pp. 35–9. Wei-pang, Chao. 1943. "The Origin and Growth of the Fu Chi." Nanzan Institute for Religion and Culture: Asian Ethnology. 2. pp. 9–27. Accessed May 28, 2017. I assume that you will understand that when you make a comment like " Interestingly, though this practice did prove the falseness of the spiritual claims, experiments revealed it was caused by the aforementioned accidental movements or muscular twitches by the participants." you are making a claim exactly parallel to saying "experiments did prove the falseness of medical research". EID comes after just after the month of Ramadan is Also Called as EID ul- Fitr and the Bakari EID is called as EID ul- Adha. Like pendulum, the board works by extern intervention and one of this are the muscular nerves of two diferent arms. Of course that the pointer doesnt move by itself but these scientist cannot prove these things with primitive mens and sceptical minds. This site was interesting once, but now im reading just uninteresting references from other sites. And the title was stupid with no relation to the text. I have learned other than what is posted. It is not a toy or fun and games. How this works is the demons that have been with you and know you, as described on animal house as devil and angel talk to others demons belonging to other people, and that's how come they can be accurate, but since this world is almost vacant in learning about demons. Few are the number of believers who understand. So my warning is, if one ever stumbles upon one of these things....destroy them so they are not usable, and never give them away. It's no gift to get free demons. People can get an infestation of weirdness if it is used, but believers can purge their own home should they discover their children had just wanted to play or have fun with friends. You don't need a priest, just your own belief in Christ will allow you to cast out demons in the home or a loved one in the name of Christ. i was bred born and raised catholic, even though i was a mistake of nature. an unplanned, unwanted pregnancy and my mother hated being pregnant and sick as if they are even similar. my faith has been thoroughly tested and the good Lord must give me a F as i have failed. i have none. in fact i deserve an F+ for failing exceptionally well in the faith dept. i had a girlfriend that had a ouija board, and one time i gave it one heck of an effort and nothing at all happened. as far as demons or devils i have seen the face of pure evil. so did an assistant attorney general of the state of Washington. he was also working in the deparment of child protective services. he was a child at the same time, but he said the abuse my parents doled out on a whim was felonious in nature and they should be in prison. my oldest brother recieved the worst and my next to the oldest brother hung himself with the rope our mother used to whip us. after reading the autopsy it was crystal clear that the coroner was suspect of that very whipping/hanging rope. fortunately my parents were cop groupies and luckily had a cop friend that helped cover it all up. even though i believed in devils/demons, i also believed is saviors at that time. there were none, there was pure evil though, looks just like you and me. it is a toy, a game, no magic, no evil. Ancient Dowsing Alive and Well in Colombia? Read more about Ancient Dowsing Alive and Well in Colombia?